This is the second time Amante Franzoni crosses my path. Only last year I reviewed a recording of his Vespers for the Feast of Saint Barbara. That disc included some pieces from the second collection of music that Franzoni published. The present disc offers the complete Opus 5, called Apparato musicale di messa, sinfonie, canzoni, motetti, & letanie della Beata Vergine, which came from the press in 1613. Little is known about Franzoni's life. From 1612 until 1630, he acted as maestro di cappella of the Basilica in Mantua. It is not known whether he died in 1630, or only retired. There was a special reason to publish this collection. In 1612 Vincenzo I Gonzaga, who had appointed Franzoni, died. He was succeeded by Francesco IV, but he died within a year, and then it was his younger brother Ferdinando I; he became the ruler of Mantua and its territories, and apparently Franzoni felt the need to publish music in his honour. The Apparato musicale includes music for the Proper and the Ordinary of a Mass, as well as instrumental pieces which serve as introductions to the sections of the Mass. It also contains music for the Office: three motets for eight voices, a concerto on the chant Sancta Maria, ora pro nobis – which has the same structure as the Sonata sopra Sancta Maria in Monteverdi's Vespers of 1610 – and a Litany for the Virgin Mary. The music was written for the feast of Saint Barbara, the Gonzaga's patron, to whom the basilica was dedicated. There are no specific references to Barbara in the music, but the motet Duo Seraphim, a piece in honour of the Holy Trinity, can be connected to her. Tradition has it that when she was imprisoned in a tower during her father's absence, she asked the builders who were working on her tower to add a third window in honour of the Trinity. The programme documents what a solemn mass in Franzoni's time could have been like. The disc opens with the two first sections of the Mass in the 6th mode, Kyrie and Gloria. The former is introduced by an instrumental introit for four voices. At that time a vocal piece could be replaced by an instrumental item. The Canzon francese a 4 per l'Epistola is such a piece. It has the addition La Gonzaga, reflecting the dedication of this collection to Franzoni's employer. After the Credo from the Mass we get the Offertorio, which is the eight-part motet Laudemus Dominum ("Let us praise the Lord whom the angels praise"), which is divided into vocal and instrumental sections. Next follows the Sanctus, preceded by an instrumental sinfonia. Aperi oculos tuos is an Elevation motet: "Open thine eyes, and see our desolation". Licia Mari, in her liner-notes, states that this seems a rather odd choice for a joyful event, but she refers to the musicologist Graham Dixon, who believes that Franzoni's choice was inspired by the tragic events, following the death of Vincenzo I. "In 1612, after the death of Vincenzo I in February, his son Francesco remained in power for not even a year and his death (a month after that of his heir, still a child) generated great apprehension for the Gonzaga dynasty. It is plausible that the appeal for help is especially heartfelt for this reason." The motet is followed by the Agnus Dei, again introduced by a sinfonia. Next comes another instrumental piece, the Canzon a 4, for two treble and two bass instruments. The Mass is followed by two motets, both for eight voices. First we hear Franzoni's setting of the Duo Seraphim. The first two lines, about the two angels, is sung by two sopranos. Then the whole ensemble enters on the text "the whole world is full of thine glory". "There are three", says the fourth line, and here the two sopranos are joined by a tenor. It is followed by a passage for lower voices. Next three different voices sing one of the three names: Father, the Word (the Son) and the Holy Spirit. Whereas, as has been noted, this motet can be connected to Saint Barbara, the other two motets could refer to two other saints: Cantantibus organis is about Cecilia, the patron saint of music and musicians, and Catharina Virgo refers to Catherine of Alexandria, who was venerated as a saint in the Church of the East and the West. The Litany, like the motets scored for eight voices in two choirs, ends the programme. As I wrote, this disc gives a good impression of a solemn Mass in the early 17th century. It shows that a maestro di cappella had many options, and this resulted in a wide variety in the liturgy. It also explains the number and variety of collections of liturgical music published at the time. The sequence of pieces included here is just one of the options. 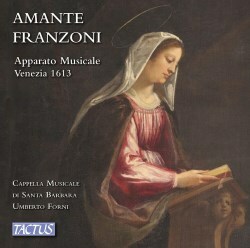 The live recording took place in the basilica in Mantua, where this music must have been performed in Franzoni's time. It allows for the use of the magnificent organ, built by Graziadio Antegnati in 1565. That has a considerable effect on the performance, especially in the instrumental pieces. One will not hear such a colourful instrument very often. Obviously its meantone temperament is also a substantial asset. On the other hand, the acoustic causes some problems: sometimes the voices and instruments are a little out of sync. Considering that this is a live recording, there is surprisingly little noise. The noise there is could have been removed, but unfortunately the engineers have not done so. At the end we hear applause, and again I would have preferred that to have been removed. However, the main thing is that the music gets the opportunity to blossom, thanks to the excellent singing and playing. The singers deliver fine performances of the solo parts, and together they build a real ensemble, in which voices and instruments blend perfectly.